Most of the works from Vincent Beaufils-Hourdigas are in stone, sculpting the pieces up and back until the moment, when he decided to fix the time into a form, looking for a relation between solids and blanks into the material. He leave the space to filling itself, touching by an eye, feeling the sense of the material. From different European countries, where the artist use to sculpt; Ireland, Spain, Portugal, Italy, Belgium are the bases of techniques and structural inspiration in his backpacker’s life. To find the Deep into the mass, Vincent B-H experiments the dynamics with an own language of volume, in the resonance of the soul’s material, catching the essence of his work between lines of an abstract’s “Kurve” and a composition’s plan from minimal architecture, always listening the instinct which conjugate the finality of his Frame’s stone. 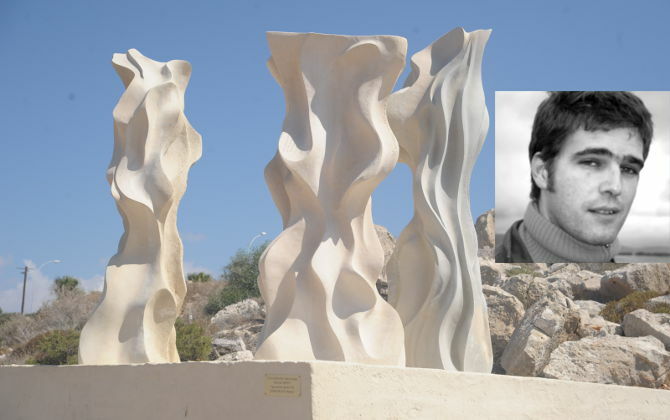 In 2011, he’s got one of the sculpture’s prices from the Fine Art Academy of Paris. He works as well in bronze, when the original material aims to be a new font of regeneration in the process of work. To keep a trace, and join a new kind of soul into chromatics research on the hot process required. Way of life, time to another, not just for disturbing any else, after the stone he recycles the ready-care from re-creative process’s, bain-Marie of installation in introspection, giving back to the result some reflexing about an hiding reality between contents and containers, bringing up to a natural element which the sense of existing was falling down in profusion, neighbor to the human basification, or far away in the human restriction : retract on the way, leaving intervention for un-functional attributions, and conceptual resolution. “Pixelisation” in the present, one of himself is writing a dogma about the « not at all » in a medium not so unknown, for un-sculpt process and sociologic end.Up to that, Vincent Beaufils-Hourdigas decided to improve process’ sculpture in Europe, where clandestine interventions are getting form ; in “Sieme a lo Suo”. Title of the project: "Organic Tryptic"
Concept: " Before running into the fury of torrents The water was married to the gold of the sun, Dreaming of a sleepy lake, she won’t want to wake up Before touching the sky. Without a word, movements of the water are already Singing the Symphony of tears, To flow for watering the mountains. Because the ocean will not have to know The Despair of deserts. Water flows so fast, Than she forgets to listen herself; And finally a dream, to her some waves floating into a blue sky...into the Peace and messages from all of Them, Young and so young who want to leave lines into the stone For long whiles into the humanity."